It’s been an interesting and insightful week for me and it would seem to be one worthy of starting my first Blog. I attended my inaugural Board meeting on Wednesday, since being promoted on the 1st January – you can see details of my new role here. Lewis and Hickey have some large and exciting opportunities in the pipeline at present and business is slowly picking up which is encouraging. We recognise the need to be continually changing with the times and I hope to personally bring some fresh ideas and involvement in that process over the coming months. One of our largest ‘sectors’ and one which I am very close to is Student Living, for Higher Education institutes. We are working with a number of Private Developers and Universities across the length and breadth of the UK on some significant projects at present. I hope to tell you more on these new projects in due course. We have delivered in excess of 10,000 student bedrooms over the last five or six years and have somewhere in the region of 5000+ beds in various stages of development at present. This is a strong sector to be in, but as with all investment related business, it still has its challenges. 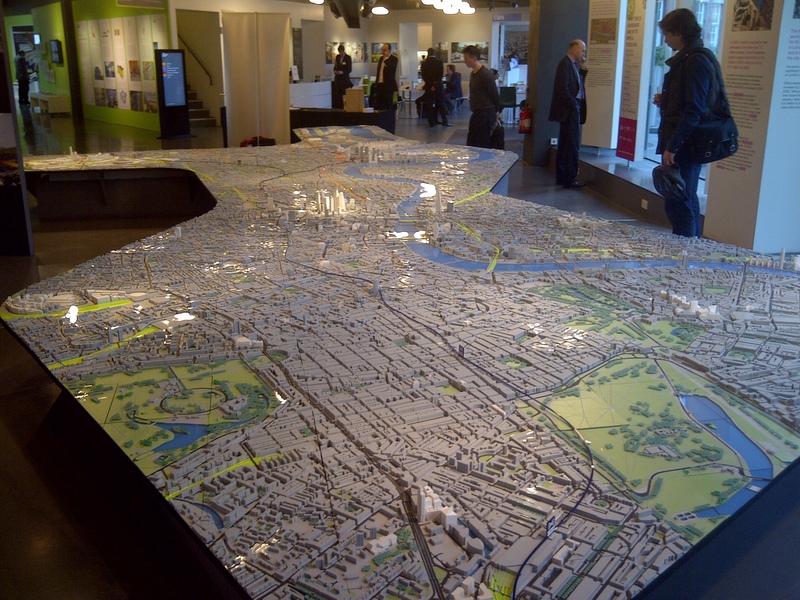 On Thursday morning I attended an NLA conference at the Building Centre in London. The venue is an Architects dream as in the reception area there is a huge scale model of central London, with every existing and proposed building on. It also includes the 2012 Olympic village (somewhere I’ve still not managed to get down and see yet). image above. Looking from North West London due East. Regents Park on the left, Hyde Park on the right, our office is in the middle, just near Baker Street. The Conference title was “London’s Student Resi Boom: Bucking the trend?” There still appears to be strong demand for further student living in London (and the regions), but London’s International market puts it on another level. Did you know that ‘premium’ student accommodation (a one bedroom flat) in central London will cost you £550 a week! That works out at nearly £30k a year – just for your accommodation. Add £9000 a year fees + general living expenses and a three year degree could be costing easily as much as £125,000.00 in London. Admittedly that’s at the upper end, but a degree outside of London will easily cost £50k+ now. There were some interesting thoughts on emerging trends in the very latest student accommodation schemes out there now. It was also great to see one of our projects and 3D visualisations shown as an example of ‘new ideas’ for student bedroom concepts. So, as I said earlier, the sector is strong…and it would appear that everyone wants a piece of the action! Busy times ahead we hope. After a busy three day stint in London, I was glad to head back to Nottingham and today I attended the Invest in Nottingham lunch at the world famous Trent Bridge cricket ground. This was first used as a cricket ground in the 1830’s! Today, in its very contemporary form, it’s an impressive facility to be at – even though it was largely empty! Mark Chivers of Boots talked about the master plan proposals for the ‘D2N2’ Enterprise Zone in Nottingham – an exciting opportunity for the local economy and region in general. The intention is to create between 5000-10,000 new jobs through an integrated development which will bring together Housing, Business, Manufacturing, Logistics, Research and Development and more – all in collaboration with Central and Local Government (LEP), the University of Nottingham, Nottingham Trent University, BioCity (the birthplace of Ibuprofen) and multiple Private sector partners. Andrew Moore of East Midlands Trains also talked about progress on the Nottingham station redevelopment and the NET Phase two tram line. This is an important and much needed transportation hub for Nottingham, both locally and providing National and International connectivity.